17. John Bolton, former U.S. 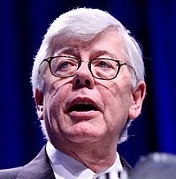 Ambassador to the U.N., who has opposed the U.N. Arms Trade Treaty and warned of its dangers to Americans’ right to bear arms. 18. Former Texas Gov. Rick Perry, an avid hunter and gun owner who once shot a coyote that attacked his dog while they were out walking. 55. Dan Cannon, the founder and editor of GunsSaveLives.net, which draws nearly three million “hits” per month. The website lists hundreds of stories relating how armed citizens have protected themselves against criminal attack.